Hanging… with the North Carolina “Black Wall Street” Hayti Historian and Pioneer Class member of Duke University, Nathaniel B. White in Durham — Really Makes One Think of Project-based Learning! Nat “Buddy” White is always on-the-move… and… he always gives back in Atlanta, GA and North Carolina! 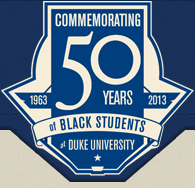 In Durham, NC where we met he is one of the living legends (from Durham) that Duke University is celebrating with its 50th Anniversary of racially integrating the prestigious educational institution (http://spotlight.duke.edu/50years/#about-us) and he is working on: 1) programming for the Durham, NC based Circle And The Round, LLC (An Art, Global Culture & Limitless Personal Empowerment Organization) and, 2) syndicated content on Durham Black history for funded academic projects, print and digital periodicals and media talk shows. 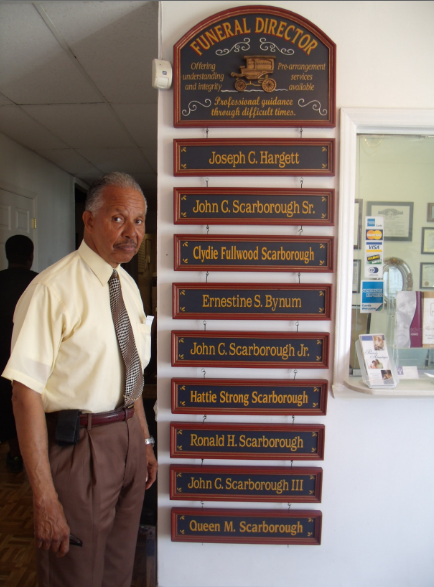 I met Scarborough & Hargett’s, John lll (above) and was delightfully educated about the “people of Durham” and economics, business history, Hillside High School, money, family values, sports and black folks. He made me feel like one of the guys (as I was one of Buddy’s associates) and I fell in love with some photos of people I had never and could never meet. It’s amazing how well [we] lived generationally; what we knew before (so to speak), and… what’s destroying our communities, culture and even killing us individually today. I think that John lll has really been in love with the “lives and talents” of his neighbors all-of-his life. He is so full of sensitive, kind and proud reflections about ‘his’ people. His “respect” for human beings is rare today. In effect…Nat and I tested his idea of an Intense CITR One-hour Oral History and Review of Historic Artifacts for Traditional Businesses in African American Hometowns U.S.A. The idea works! The project-based learning series is for a new online educational and enrichment extension of the Durham, NC based, Circle In The Round, LLC. (CITR). The project curates information/artifacts about the ideas, reflections and the world-views of scholars, artists, business leaders and living legends. This “evidence-based” hometown research project essentially features influential baby-boomers and makes real people-connections… with Durham’s historic Hayti Community and Atlanta’s historic Sweet Auburn neighborhood. I will be engaged (et tal) to do current digital multimedia interviews and facilitate digital storytelling projects and funded oral education segments. Just imagine, John lll’s historic business case study introduced to MBA students and even to high school students who are college bound that want to learn about business and mathematics (?). That’s real-world learning! Human History is an Education! Most agree that young people (Millennials etc.) really need to connect with older people (Great Society and Baby Boomers). We always agree also with the proverb that it takes a village to raise a child and so…we really have to begin by organizing substantive talks again with the knowledgeable members of the village right now! There is a crisis in the classrooms and our children today only see… a lot of virtual games… and reality television… and they think that, that is what fun is and if they are not around a lot of older people… they even think that reality television… is what grown-ups usually “talk” about — and how real people… live. Anything is… better that Love & Hip-Hop etc! Our school-aged kids (students) need more home-community-school and learning threads and really need to do more academic, social and inquiry-based entrepreneurial field trips to small and major businesses. After meeting John lll, I think that a Science project is in order to learn about ideas mentioned above and…where black people are buried. This research is very educational and the resulting forensic projects (STEM) at our historic black cemeteries is a win-win to get together with businesses like John’s. You can expect a follow series of short video Q&A’s with John lll from time to time in Groovetrak. He is a rare business leader — and we really respect and thank him for his time and attention. You should ask your local community-based funeral directors across the East Coast corridor- what’s killing our young and older people where you live! A Special Thanks to Groovetrak Network member, Nat White! Nat’s science background makes him a natural curator. This coupled with his enormous professional experiences with civics, education, public health, and community development qualifies him as a rare scholar-practitioner. LEARN NC,K-12 Research Triangle Public School(s), American and international universities will need his project based learning ideas and forthcoming curriculum.